The Let’s Move Outside! Erie County Recreational Passport is a collaborative program of Erie Yesterday, Erie County Department of Health and VisitErie, and is Erie County’s pilot initiative as a Let’s Move! County. It’s an innovative program promoting healthy living and physical activity through the use of public art, local history and outdoor recreation. How does the LMO! Passport work? STEP #1: Register on the program website www.letsmoveoutside.org. Registration allows you to document your progress and work your way toward qualifying for the grand prize drawing in November. 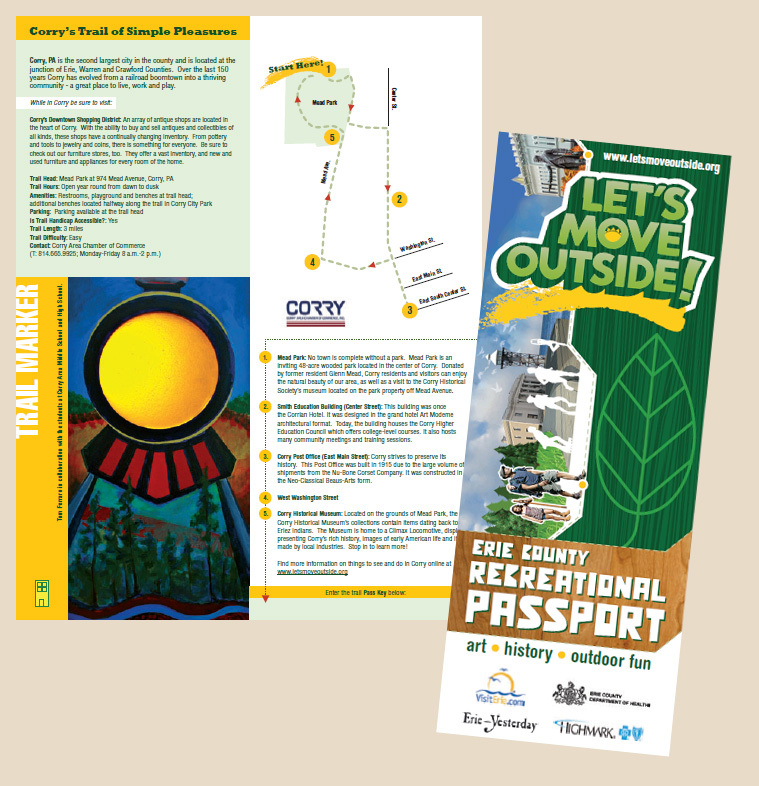 STEP #2: Walk, run or bike the passport’s 15 trails and find the single artist-designed marker located along each trail. A unique 10-digit pass key is displayed on each trail marker. Once you find a marker, record the pass key in your passport booklet. (Remember to take a pen or pencil with you!) You can log in to the program website at any time and enter the pass key. After entering all 15 pass keys, you are automatically entered into the grand prize drawing. You could win a mountain bike or one of several other great prizes. Passports are available at Erie County’s Public Libraries, the YMCA of Greater Erie and its branches, the Tom Ridge Environmental Center, VisitErie, Erie Yesterday’s member historical societies and museums, and the offices of Harborcreek Township, Fairview Township, North East Chamber of Commerce, Corry Area Chamber of Commerce, Asbury Woods Nature Center, Girard Borough, Washington Township and other sites throughout the county.